Jennifer Lopez, still scrappy, is wasted on a dull-edged business comedy with little resemblance to the real world. Theoretically, Second Act sounds like it could be charming: a fairytale rom-com à la Working Girl. Maya Vargas (Jennifer Lopez), a fortyish assistant manager at a superstore in Queens, has been at her job far too long. After losing out on a promotion to a smugly corporate white guy with a degree, she manages to get a high-powered job at fancy-pants consulting firm Franklin & Clarke, all thanks to a preposterously forged résumé submitted by her godson. Will Maya bring sass and a different skill set to the business? Will she learn new things about herself, while gaining valuable relationships? If you’re uncertain of these answers, you’ve probably never watched a movie before. 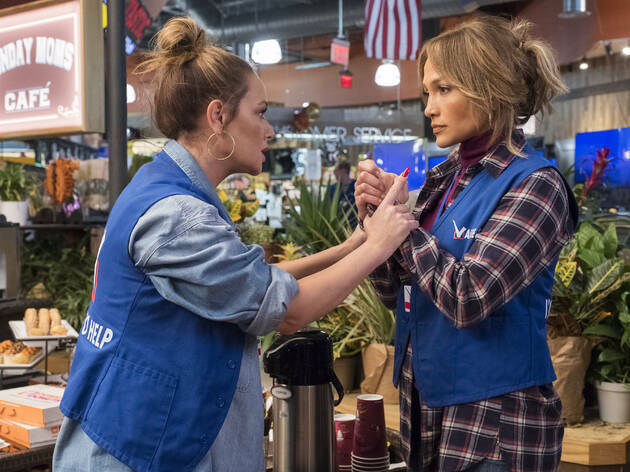 Lopez remains charismatic, and she and real-life BFF Leah Remini have some fleeting comic exchanges, but Second Act is all about broad, corny moments. A late-inning twist involving Maya’s personal connection to her competition, Zoe (Vanessa Hudgens), a rising Franklin & Clarke star, is particularly cringe-inducing. The film crams so much borderline-absurd exposition into its running time that it starts to feel like a soap opera: A few montages or teary speeches could easily have been cut and no one would be the wiser. Justin Zackham and Elaine Goldsmith-Thomas’s screenplay is weighed down by platitudes (being yourself is valuable, etc.) and plot holes are par for the course. This is a professional world in which references and background checks barely exist. But the failings of Peter Segal’s direction are worse: Maya’s former coworkers play like blustery stereotypes of outer-borough working-class women while, at Franklin & Clarke, everyone fits neatly into a different mold—a blond ice queen, a nerdy scientist, a quirky and awkward assistant. Second Act is an aspirational Pinterest board of a film, too bland to make an impression. If only the world saw street smarts as equal to book smarts, Maya wishes on her birthday. It’s a nice idea, but Second Act doesn’t possess smarts in either category.